An R package for creating slideshows with remark.js through R Markdown. 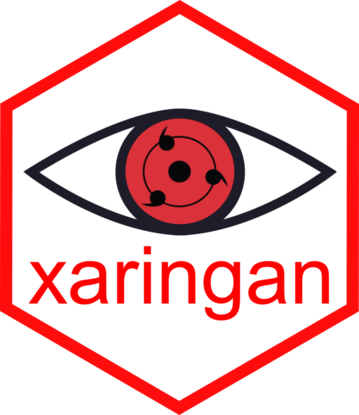 The package name xaringan comes from Sharingan, a dōjutsu in Naruto with two abilities: the "Eye of Insight" and the "Eye of Hypnotism". A presentation ninja should have these basic abilities, and I think remark.js may help you acquire these abilities, even if you are not a member of the Uchiha clan. If you use RStudio, it is easy to get started from the menu File -> New File -> R Markdown -> From Template -> Ninja Presentation, and you will see an R Markdown example. Press the Knit button to compile it, or use the RStudio Addin Infinite Moon Reader to live preview the slides (every time you update and save the Rmd document, the slides will be automatically reloaded; make sure the Rmd document is on focus when you click the addin). Please see the issue #2 if you do not see the template or addin in RStudio. The main R Markdown output format in this package is moon_reader(). See the R help page ?xaringan::moon_reader for all possible configurations. The remark.js Wiki contains detailed documentation about how to format slides and use the presentation (keyboard shortcuts). The xaringan package has simplified several things compared to the official remark.js guide, e.g. you don't need a boilerplate HTML file, you can set the autoplay mode via an option of moon_reader(), and LaTeX math basically just works (TM). Please note that remark.js does not support Pandoc's Markdown, so you will not be able to use any fancy Pandoc features, but that is probably fine for presentations. BTW, you can use raw HTML when you feel there is something you desperately want but cannot get from the basic Markdown syntax (e.g. knitr::kable(head(iris), 'html')). As the package title indicates, this package is designed for ninja. If you are a beginner of HTML/CSS, you may have to stick with the default CSS (which is not bad). The more you know about CSS, the more you can achieve with this package. The sky is your limit. Do not forget to try the option yolo: true under xaringan::moon_reader in the YAML metadata of your R Markdown document. Big thanks to Karl Broman!